Filtering, pagination and column sorting all work through the same mechanism in Fae. To use any one of these, you’ll need to add a route to access the built in filter action. If you need to filter your content on your table views, Fae provides a system and helpers to do so. Using the helpers provided, the filter form will POST to a filter action inherited from Fae::BaseController. You can override this action, but by default it will pass the params to a class method in your model called filter. It’s then up you to scope the data that gets returned and rendered in the table. Let’s walk through an example. Using the Person model from above, let’s say a person belongs_to :company and has_many :groups. We’ll want to use select filters for companies and groups, and a keyword search to filter by people and company name. The search field is built into fae_filter_form, but we’ll need to provide a fae_filter_select for each select element in our filter bar. Heavy customization of views can confuse the AJAX function that injects results into the table. This can be solved by adding the class js-results-table to the results table. Finally we need to define our class methods to scope the Person class. This data will be assigned to @items and injected into the table via AJAX. ModelName#filter(params) will be the scope when data is filtered. The params passed in will be the data directly from the fae_filter_select helpers we defined, plus params['search'] from the search field. So let’s use that data to craft our class method. conditions[:company_id] = params['company'] if params['company'].present? conditions['groups.id'] = params['groups'] if params['groups'].present? Displays the filter form, which includes the search field, submit, and reset buttons. It accepts options, followed by an optional block. Dislays a select tag to be used within a fae_filter_form. If your index tables are stacked with items and it’s taking a while to load, you may consider adding pagination to them. To do this, just follow these steps. The fae_paginate helper can be called anywhere and will return correct links to paginate @items, given @items is an ActiveRecord collection. However, directly under the table is where our CSS supports it. Other places may need additional CSS. Pagination is disabled in the Fae:BaseController by default. This can be customized with a private use_paginationmethod in controllers inheriting from Fae::BaseController. 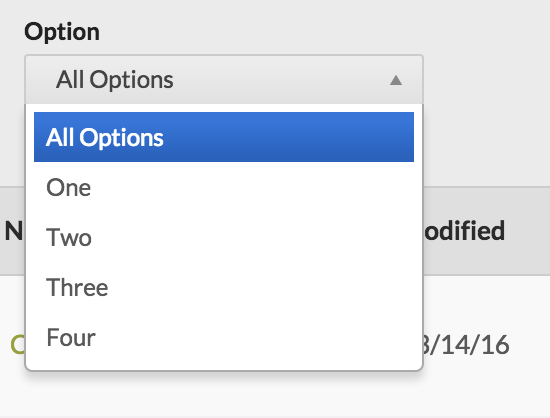 Column sorting is easy to add in if you aren’t paginating your table. Adding a js-sort-column class to the table will make the table headers clickable, allowing you to arrange the items in the table via the data in the column. This method relies on the data already in the table, so if you are paginating your items, only the current page you’re on will be sorted. This is probably not the expected functionality, but Fae has a second way of dealing with this. Then remove the old js-sort-column class from the table. For each column you want enable, add a data-sort attr to the <th> following these conventions. association_name must be an existing column and association_name must be a defined association on the current object. If your object has already been created you’ll have to do a couple steps to make it sortable. 1) Add an integer position column on your object with a type of integer.